Alberta has a new tourism brand, and they want you to breathe! Alberta's mountains, vistas and landscape are often described as breathtaking. So it's no surprise that Tourism Alberta's new tourism brand is remember to breathe. At first I thought it a bit on the corny side, but after watching the remember to breathe video, it's a good fit. I particularly like the accompanying music, by Candian recording artist Wil of Vancouver Island. Gotta hear this guy in person soon. Travel Alberta, the tourism marketing agency of the Government in Alberta, is hoping to raise awareness about the province with travelers around the world. Currently, tourism in Alberta attracts more than 22 million visitors a year to the province, who spend $5+ billion. The industry generates more than $2 billion in annual tax revenue and employs more than 90,000 people. So who's the target audience? Youthfully-spirited travelers. 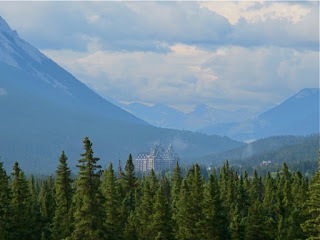 "The brand promise speaks to the emotional connection that surprises a first time visitor, and the feelings that keep travelers coming back to their favorite places in Alberta," said Royce Chwin, Travel Alberta's Managing Director, Global Marketing and Brand Strategy. The new branding was an 18-month process that included collaboration with industry stakeholders representing all regions of the province, as well as opinion research with frequent travelers in Alberta's target tourism markets in Canada, the US, Europe and Asia Pacific. No mention as to which advertising --public relations agencies were involved in the branding. The first phase of remember to breathe is Travel Alberta's winter consumer campaign in the US and Canada that begins in November. The multi-media campaign includes television commercials, print advertising, social media and a new website appropriately called www.remembertobreathe.com.